My first time here. I'm still learning my camera's settings. Exploring those, I discovered the sepia and black & white. I'm thrilled! The day I took the squirrel shot, it was quite windy. Stunning sepia of the spring. Hi Mary, Much as I like the foreground of this photo, it is the universal anywhereness of the background that intrigues me. It could be my street or around the corner or across town or on the other coast. Nice picture. 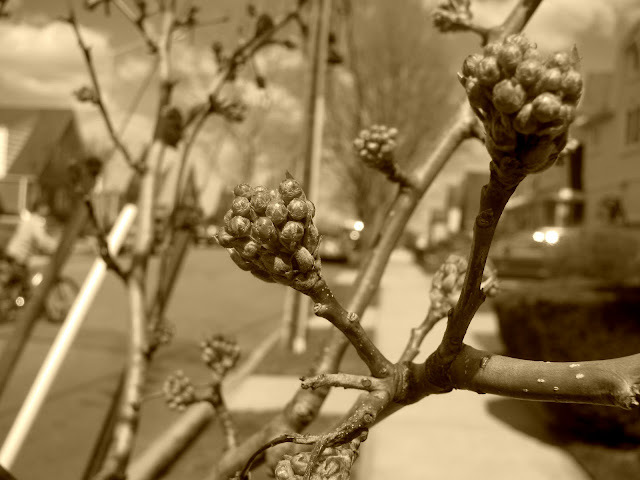 oh-oh-oh....these look like lilac buds - Dear Spring, we surely welcome you to visit our chilly state, here in Vermont.